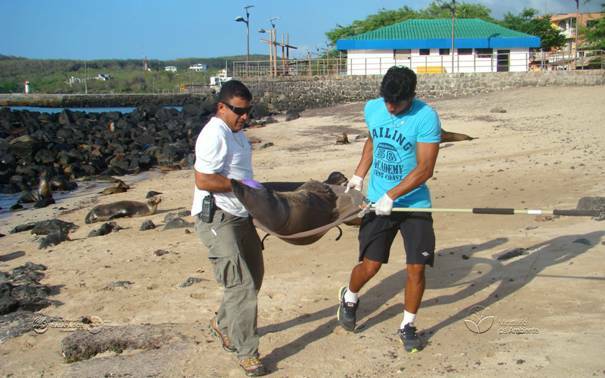 Sea Lions Under the Microscope in Galápagos: Here's to Your Health! But this proximity of sea lions to humans and other introduced species presents problems. It is estimated that between 16,000 and 18,000 sea lions inhabit the Galápagos. In 2008 they were included in the Red List of the International Union for Conservation of Nature (IUCN) as an endangered species. Park technicians and volunteers from participating institutions have been capturing sea lions in various colonies and drawing blood and mucous samples. The teams place numbered tags on the front flippers of the animals to aid in identifying individual animals. The samples are analyzed at the Laboratory of Microbiology of the San Francisco University of Quito. Initially about 200 samples were collected in breeding colonies of sea lions in San Cristóbal, Española, Floreana and Santa Fe islands. In a second phase, the study will extend to Santa Cruz, Seymour and Isabela islands. The study will last two years. Carlos Ortega, a technician from the park said that an international panel of experts will discuss how humans can better share the island and protect the sea lions.